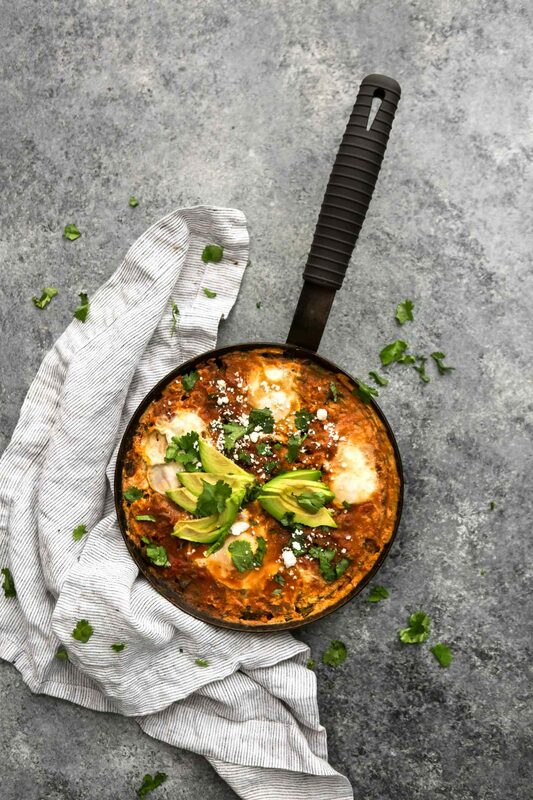 This enchilada skillet is a riff off shakshuka and this curried tomato egg recipe. The sauce is an enchilada sauce that I quickly throw together. And there aren’t many ingredients beyond that. I also like to make an extra batch of the sauce so I can have enchiladas for dinner later in the week. 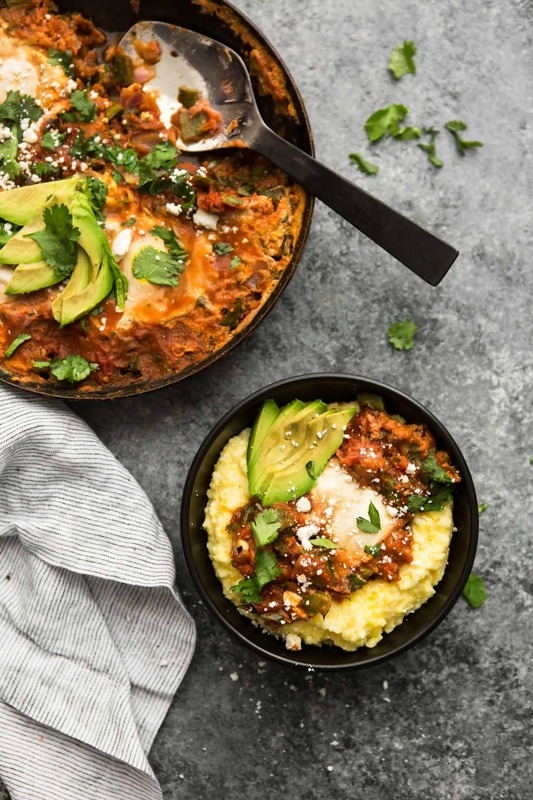 A cross between shashuka and enchiladas, this skillet cooks eggs in a homemade enchilada sauce and is served over creamy polenta. In a blender, combine onion, garlic, tomatoes, cilantro and spices. Pulse 3 to 4 times until blended, but still chunky. Set aside. In a 12 inch skillet, heat 1 tablespoon olive oil over medium high heat. Add peppers and cook until blistered, about 5 to 10 minutes. Reduce heat to medium. Pour blended tomato sauce into skillet. Bring to a simmer. Create a small well in the sauce on the side of the skillet and crack egg into the shallow well. Repeat for each egg. Cover and let eggs cook until whites are set but yolks are still runny, about 10 to 15 minutes depending on heat of the pan. 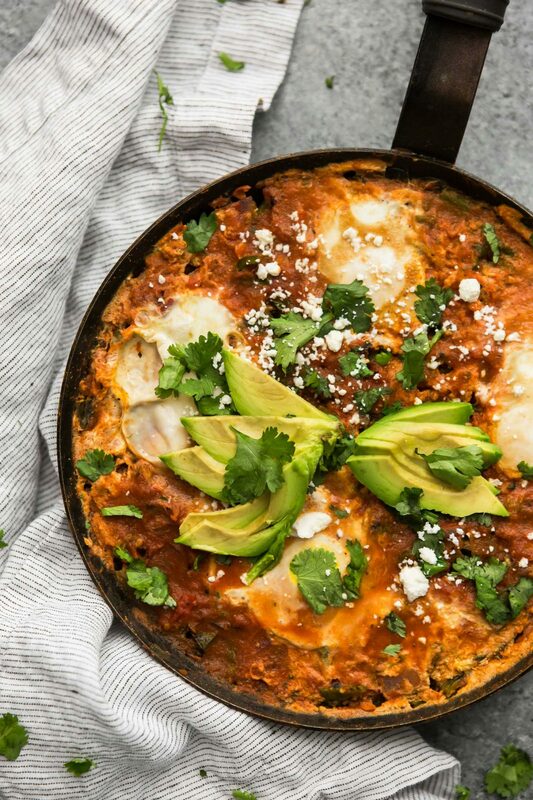 When eggs are done, top with cilantro, cotija and avocado. Tips & Tricks: If you prefer your eggs more cooked than over easy, keep them covered longer. Tomatoes: Can’t find whole tomatoes? 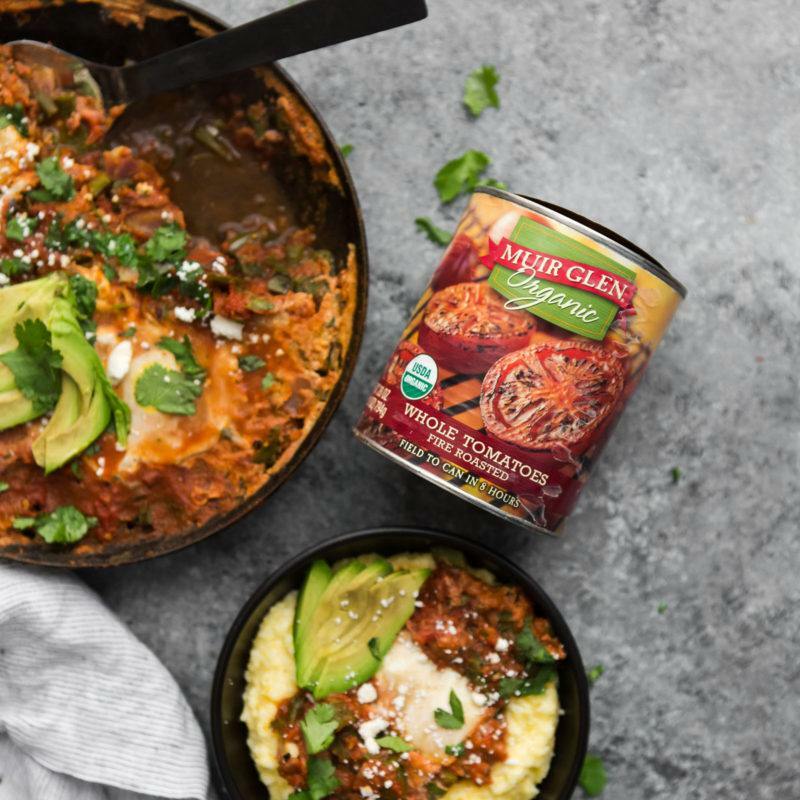 Crushed tomatoes are a great swap! They’ve got a bit more sauce so the dish will have more liquid. Grains: I love the creaminess of the polenta with the acidity of the tomato. Plus, it harkens to the corn tortillas I use for enchiladas. However, you could also serve over a bowl of millet or brown rice. Peppers: Poblano peppers definitely have a bit of a kick! If you want a more mild dish, swap for green bell peppers. Or, if you want to turn up to heat, use jalapeno or Anaheim chilies instead. Oh man, polenta is one of my favourite sides to serve with other saucy goodness! I also eat oatmeal for breakfast every day but I think this would make a delicious dinner instead. Yummo! I’ve made this twice now and love it! 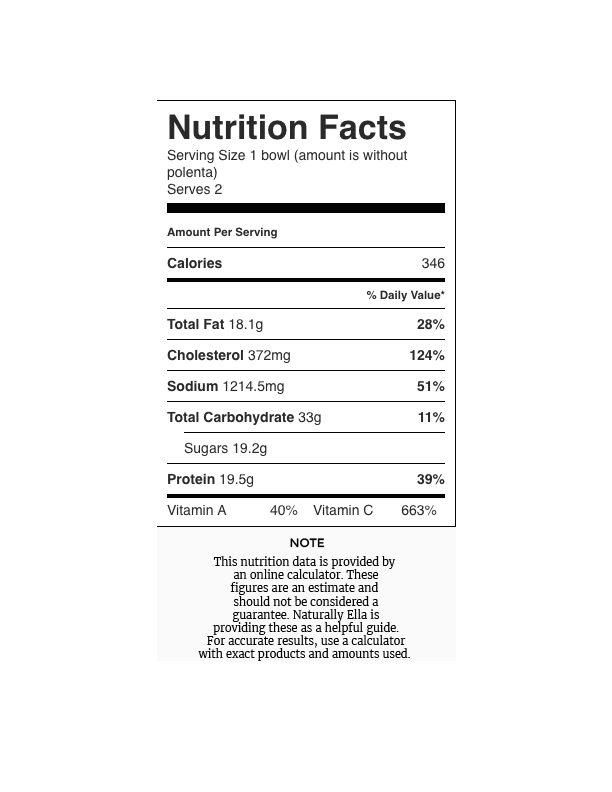 We’ve been using 2 poblanos, not 10, since that’s closer to 2 ounces – does that seem right? Yikes! That should read 1, not 10. Your instinct was right! 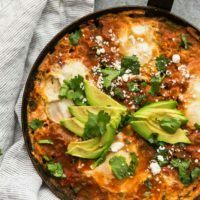 Work feta work instead of cotija?